The Antols are collectors. Walk into Bob and Barb's Colonial in a leafy and hilly neighborhood of Poughquag and you'll be greeted by a four-foot-tall teddy bear. Barb has 1,200 of them, many of which are scattered throughout the house. She rotates them, depending on the season. This one, holding a Valentine heart and wearing a white knitted scarf and beret, is the biggest; the smallest measures about half an inch. 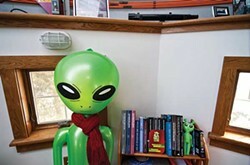 Walk to the back of their house and you'll find a huge wall of bookcases, crammed with Bob's science fiction novels. Step through a door and into the extension and note the octagonal nook in the corner. More bookcases. More sci-fi. And quite a lot of models—a lunar and command module from the Apollo era, the Mars Rover, rockets and space ships, a fighter plane. The right-hand section of the octagon is closed off by a door, which leads to a spiral staircase, but we'll get to that. Behind a thick, square pillar there's a home office. Beside it, there's a hatch to a space tucked below the stairs. Storage space, surely. Actually, that's Barb's Harry Potter viewing space. It's where she goes to indulge in her Potter addiction and re-watch all the movies. Even though it's only a few feet deep and wide and chest-high, she has stuffed some pillows, a DVD player, and a fold-up projection screen in there. Oh, and more bears, of course. The pillar has a painted portrait of a cat affixed to it. He was called Grimaldi—like all the Antols' cats, he was named for a lunar crater—and he passed away a decade ago. His legacy is this space, formally baptized Grimaldi Tower. Okay, through the door and up the stairs then. At the top of it, you enter Stargate 4173. That is to say, the second floor of Grimaldi Tower is an observatory. Atop the five-foot high walls of the octagon, each of them with a little window in it, sits a 16-foot-wide and 8-foot-high dome. When Bob presses a button, a strip of it slides out over the top and another hinges away at the bottom and he has an open window onto the sky. This gap in the dome allows him to peer out at the universe through his bulky, bright red and black telescope that sits in the middle of the room. It's an RC Optical Systems model—a Ritchey-Chrétien, notable for its two hyperbolic mirrors and carbon truss, which cost $24,750 back in 2009. With a second button on the wall, he instigates a big whirr as he rotates the dome to align the big gash with whatever planet, star, or moon he'd like to examine. A laptop on an adjacent table is running The Sky 6 program that lets Bob click on any object in the mapped universe. When he does, his telescope hums into action, twisting and contorting itself to point at just that spot and zoom in. Surrounding the telescope are a tall, standing green inflatable alien, the classic kind with the almond eyes. It's wearing a red scarf—it's February, after all. On the ledge of the wall below the dome, there are a great many more sci-fi doodads, mostly models of the various vehicles on Star Trek and Stargate. There are framed pictures of since-deceased cats the Antols have had—they have four today. And, naturally, there's a teddy bear in a NASA uniform. 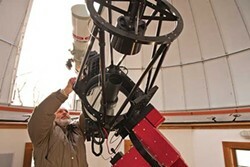 The Antols, who are both retired from 30-odd-year careers at IBM, built their house in 1989 but didn't complete the observatory until a decade ago. They had spent two years talking about it before they even settled on the right idea for it and found Poughkeepsie-based architect Dan Contelmo and a contractor. "I'd read a lot prior, and a lot of wives weren't as agreeable as Barb was," says Bob. Barb: "I thought it was a great idea." The Antols’ home is filled with astronomy manuals, science fiction novels, and science-fiction collectibles. As a boy, Bob had been fascinated by space and astronomy. Growing up in Des Moines, Iowa, he, his brother and some friends would sleep outside in the yard on summer nights. Without a tent, so they could look at the stars. Their parents bought them a telescope. Ever since, Bob has sought out peripheries. He went on an 11-day North Pole expedition once because he saw an ad in a newspaper about an 11-day North Pole expedition and that sounded interesting.